The young trumpeter Josh Lawrence is making quite a splash on the contemporary scene as a player and composer. “Contrast” is his second Posi-Tone album within 12 months to feature his Color Theory ensemble. What a fine band! The rhythm section includes the Curtis Brothers, Zaccai (keyboards) and Luques (bass) plus Anwar Marshall (drums) while the front line has Lawrence paired with alto saxophonist Caleb Curtis (no relation to the Brothers). Orrin Evans joins the band on piano for several tracks as does trombonist David Gibson. The album has two distinct sections. 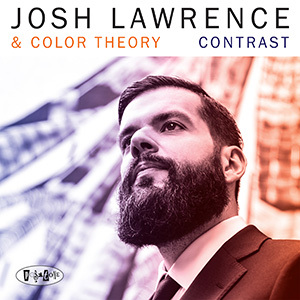 The first four tracks have the bop and hard bop feel of Lawrence’s 2017 “Color Theory“, shorter tunes with melodic heads and fine solos (“Dominant Curve” is a standout cut with its Charlie Parker-type melody and attack). The program changes on track #5, the powerful “In The Black Square.” Now, the influence is McCoy Tyner and the music he began to make in the early 1970s. The shifting rhythms (Marshall is on fire here), the pounding piano chords, and the leader’s fiery solo. The next song, “Gray“, is a handsome piece fueled by the richly melodic lines of Luques Curtis, the active drums and cymbals, and the adventurous work of Lawrence and Caleb Curtis. It opens in a fiery tone with the front line dancing through the melody and then the alto sax rides atop the rhythm section. Following that, the song slows down, with quiet sax and muted trumpet – Lawrence builds a fascinating solo, rolling his lines around the drums and bass then moving “out” near the end before the sax returns. Drums and bass reintroduce the opening section, the front line repeat the original melody and the piece romps to its close. There’s a touch of electronics on the muted trumpet opening of “Brown“, with Lawrence and Caleb Curtis exploring a fine melody. The power is kicked up a notch on “Agent Orange”, the rubato opening featuring trumpet, saxophone, and trombone. Gibson takes the first pass through the melody pushed forward by Zaccai Curtis’s powerful piano chords. Note the slight change as the bass and drums fall in to a driving rhythm for the sax solo. Lawrence has a powerful interaction with the pianist, giving the piece the feel of the classic Miles Davis Quintet music of the mid-1960s. The music fades with the pianist playing “My Country, Tis of Thee” over quiet cymbal touches. Orrin Evans on acoustic piano and Zaccai Curtis on Rhodes ride a funky beat at the onset of “Blues On The Bridge.” The opening is reminiscent of Julius Hemphill’s “The Hard Blues” but, when the keyboards kick in, the song moves into Cannonball Adderley style rhythm ‘n’ blues. The groove opens up for the trumpet solo gets back to its original “greasiness” for Evans’s playful solo. The program closes with a soft version of Prince’s “Sometimes It Snows in April“, just muted trumpet and piano (Evans again), a lovely tribute to the artist. The version does not stray far from the original ballad, the piano giving the song more weight than Prince’s acoustic guitar and trembling voice. “Contrast” continues Josh Lawrence‘s fascination with colors and illustrates how the trumpeter is expanding his palette. He is growing as an artist on so many levels, not just as an excellent soloist but as a composer and bandleader. Grab ahold of this album and get into its grooves – the music is very alive and moving!